I’m just not sure about this one. I think I’m kind of getting used to teenaged (or thereabouts) main characters that I just don’t like much – and I don’t like that, either. When her mother is killed by German bombing, Anna Cooper, 12, goes to live with her uncle in the Tower of London, where he serves as Ravenmaster – maintaining the legend that if the ravens leave the Tower, England will fall. It’s something that seems more critical now than ever, given that the city is suffering under the Blitz, and any small blow to morale would be magnified. Anna doesn’t like her uncle. She doesn’t like the Tower. She doesn’t like the ravens. She doesn’t like the other kids who live with their Beefeater fathers in the Tower, and she doesn’t like their fathers (or mothers), either. She never expresses much if any grief over her mother’s death, nor worry over her father, who is apparently serving in the North Sea.She does her utmost to make the lives of everyone around her miserable. Part of the reason for this is obvious – it’s also part of why kids don’t want to be kids, I think: they are told nothing. She overhears little bits and snatches of things, but when she tries to find out more about just about anything – from why her uncle and mother never saw each other, to what the deal is with the mysterious man she sees lurking about. She begins to suspect that one of the guards is either a spy or a traitor, and I began to very much hope he was neither because I did not want her to be correct. Another aspect of the story that irritated me was the author’s adherence to the he-punched-you-in-the-arm-because-he-likes-you, dipping-pigtails-into-inkwells school of young love. One of the boys sharing the compound is mildly monstrous to her, to a degree that when she went out of the Tower with him I worried for her safety, figuring he’d either do something terrible or abandon her. Yet, pardon what I suppose is a spoiler, by the end when they’re separated she finds herself pining for him. It’s not exactly a classic love story. When the revelation comes of who the mysterious stranger is, I might have given up if the book wasn’t already almost over. It’s based on truth – but the manner of the revelation annoyed me deeply. Overall, not a book I connected with. 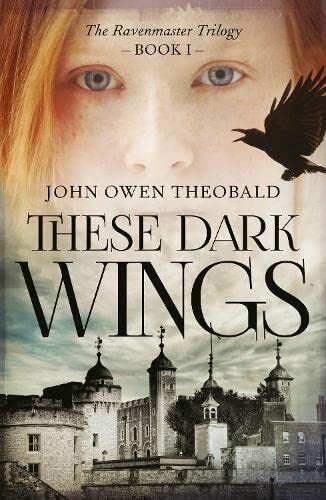 This entry was posted in books, Children's/YA and tagged John Owen Theobald, Ravenmaster, These Dark Wings, WWII, YA. Bookmark the permalink.